Mark Black (CSP), was Born with a life-threatening heart defect where he underwent two open-heart surgeries before the age of one. He battled his condition and it’s limitations for twenty-two years quite successfully, but at 23 yrs old, Mark was suddenly faced with the biggest challenge of his life. His doctor informed him that his heart was failing badly and that without a rare and dangerous heart and double-lung transplant, he would not likely see his 25th birthday. In October 2001, Mark Black moved thousands of kilometers from home and was put on the transplant waiting list. After just four months on the list, Mark’s condition grew worse and he was placed in the hospital where he lived, waiting for a miracle, for 6 months. Finally, by the grace of God, on September 7th, 2002, after almost a year on the list, Mark Black received a second chance at life: a life-saving Heart & Double-Lung Transplant. Since receiving his second chance at life Mark hasn’t wasted a moment. He has now impacted the lives of more than 100,000 in more than 350 presentations across North America with his truly unique story and powerful life lessons that help his audience members live life with passion and purpose. Mark Black conveys how we live in an age of perpetual change. He warns that those who try to avoid change will become obsolete. The power of innovation and adaptability now dominate markets and industries. The organizations who will thrive in the next decade are those focused on seeking the numerous opportunities these times will create, rather than looking back toward a time when things were simpler. Using his powerful experience dealing with the continual threat of death, Mark Black delivers life-changing insights into how to cope effectively with the adversity of change, and turn it into a catalyst for innovation and growth. Mark Black will help your organization to stop wasting time trying to bring back the “good old days” and focus on fostering a new way of looking at change. Your organization has a vision for where you are headed, but the future has many unknowns and the stakes are high. To realize your goals, you need to have everyone on board but how do you get everyone from the front line to the head office to truly believe it can happen? In “Go Big” Mark will use his life story of battling life-threatening disease, surviving a Heart & Double-Lung Transplant, to become a 4-time marathon runner, to your people see that they are limited more by their own beliefs than external circumstances. Mark provides the following programs to help you create results. Mark will tailor a customized presentation to address your desired learning outcomes and your event theme. What if living a meaningful life was never meant to be easy? If your people are struggling to cope with the fast page of change, the Resilience RoadMap is the program you need. In this presentation Mark provides the strategic framework your organization needs to develop Radical Resilience in your people. "Mark has been given twice the gift of life, and this book delivers for both. So doing his teachings justice demands us to think with our hearts as much as our minds and move forward with a passionate and productive life." 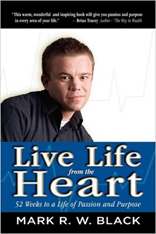 Tyler Hayden - Author - Livin' Life Large & Chasing the Carrot In LIVE LIFE FROM THE HEART, Mark Black (Heart and Double-Lung Transplant Recipient, 3-Time Marathoner and Motivational Speaker), has created a definitive guide to creating the life you've always wanted. Based on twenty-nine years of battling illness and overcoming obstacles, LIVE LIFE FROM THE HEART, is chock full of real-world wisdom and powerful life principles that will change the way you look at your life and the challenges you face. In fifty-two easy-to-read chapters, you'll learn how to: Release the powerful potential hidden within you Set goals that will help you get what you really want Alter your habits so that you can alter your reality Recognize what's really important to you Mark Black has been inspiring audiences with his powerful presentations since 2002. He is the founder of his own speaking and consulting firm, Mark Black Speaks. Mark's powerful inspirational programs have impacted thousands of people across North America. Mark's presentations are in high demand by corporations, associations and educational institutions. His story of courage and perseverance inspires people to live their lives with passion and purpose. Mark provided 3 simple but important concepts/tools to use in my life and to share with my family, friends and colleagues. He tied his personal story with solid psychological concepts in an easy to understand way. His combination of motivation with humor was very relatable.